As a youth, being the oldest son of a Leicester hosiery manufacturer, Henry Bates had been made to leave school at age twelve to learn the family business. He was expected to take it over in the future. Henry nevertheless enjoyed the intellectual pursuit of reading through the natural history section of the Leicester library. In particular, his passion was for insects, and he made a rich collection of local butterflies and beetles. At a free lecture there, he met Alfred Wallace, also a self-taught naturalist, who was building a herbarium of local plant specimens. They eagerly discussed any new book of natural history, and had read of von Humboldt's travels in the Amazon, and Charles Darwin’s Voyage of the Beagle. Eventually, they planned their own expedition to the Amazon, and were encouraged by museum curators who offered to pay for interesting specimens they might come across in their travels. Thus two relatively inexperienced naturalists set off to spend years collecting in Amazonia, and each returned to spend a lifetime contributing to the understanding of nature. Wallace, of course, is remembered for independently coming up with a theory of evolution, which prompted Darwin to finally publish his own. Meanwhile, H.W. 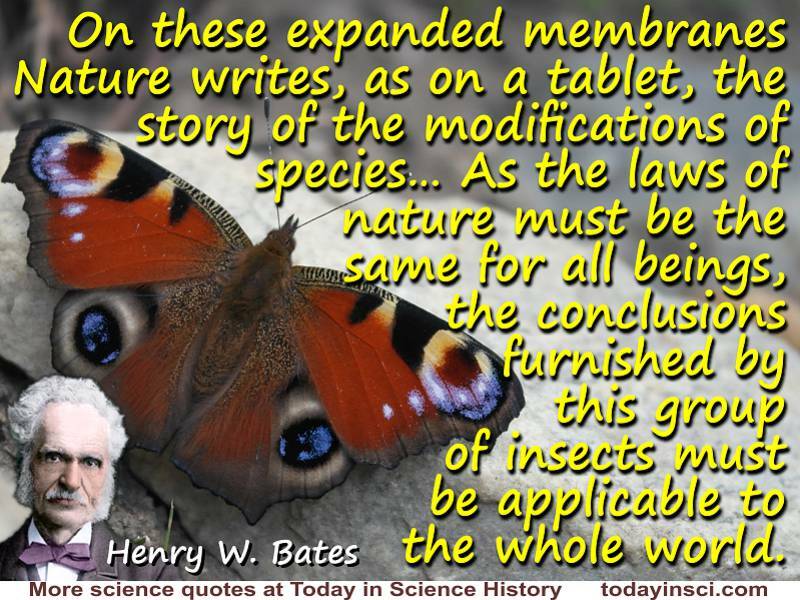 Bates became famous as the discoverer of “Batesian mimicry” (the resemblance in form or markings to a noxious, conspicuous species that deters predators of an otherwise palatable species). He had maintained correspondance with both Wallace and Darwin. Bates’ identification of the survival gambit of mimicry in many different species, provided Darwin with very satisfying empiral evidence in support of evolution through natural selection. Felix E. Goodson, The Evolution and Function of Cognition (2002), 14. Iain McCalman, Darwin's Armada: Four Voyages and the Battle for the Theory of Evolution (2010), 229-235. Science Quotes by H. W. Bates.